If you are just starting your LSAT preparation, or if you are a retaker deciding to start fresh, this book may be the best $3 you've ever spent. The LSAT is a very learnable exam. If you put in the time, and if you prepare for it in the right way, you should expect significant improvement. However, the reality is that the vast majority of test takers do not prepare for it in the right way, and the vast majority of test takers underperform relative to their capacities. This book will help you study smarter, and study better. This book includes information about *the basic design of the LSAT *the common study patterns of top scorers & *the books, courses, and other study tools that are most popular with top students today This book will not give you tips and tricks to magically raise your score, and it is not meant to serve as the primary focus of your study process. However, if you are serious about getting a top score, this book can play a critical and valuable role in helping you get off to a good start, and ultimately reach your potential. 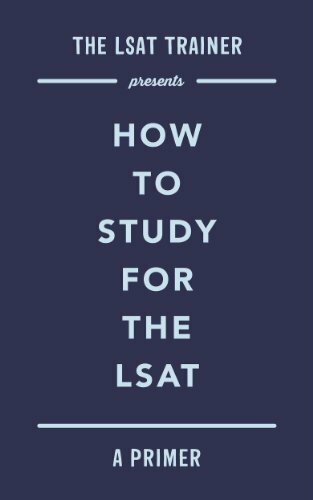 Disclaimer: If you own The LSAT Trainer, or plan on purchasing it, you do not need to purchase this book--it will be redundant. Also note that slightly altered versions of four of the chapters in this book (Introduction to the LSAT, Logical Reasoning, Logic Games, and Reading Comprehension) are available as free downloadable PDF's on the LSAT Trainer website. However, the PDF's do not have contain real sample LSAT questions; this primer contains 18 real LSAT questions.